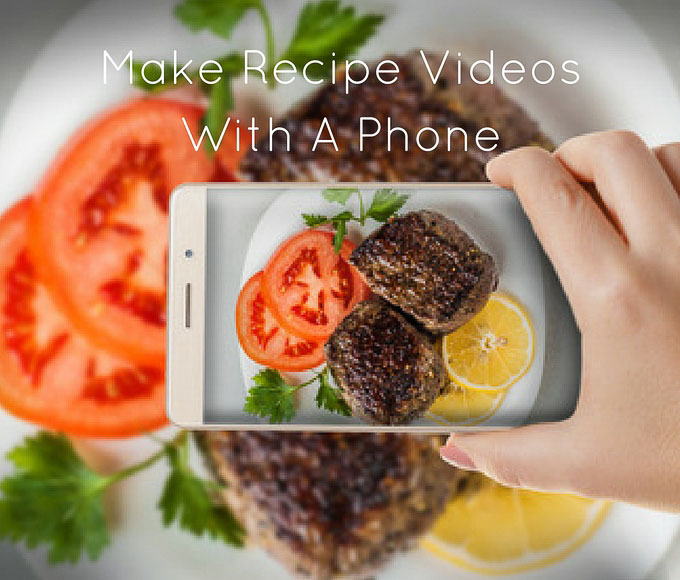 I will show you How to Make Cooking Videos Using Smartphone and inexpensive equipment for beginners. Have you ever seen those short cooking videos on Facebook, Instagram, YouTube, and even Twitter? Have you wanted to make one, but thought to yourself : I can’t do it, because it is too hard, it’s too expensive to buy all the equipment, and I have no experience filming video. I thought that also when I started making cooking videos just 6 months ago as a complete beginner. I was really scared and had avoided trying it. After taking a couple classes, reading every book I could find on the subject, and practicing, I finally feel comfortable making short cooking videos for YouTube, my blog, Facebook and other social media sites. I make mostly videos that only have my hands and the ingredients in the videos, as I’m still very uncomfortable being in front of the camera and talking on camera. I am very awkward and nervous on camera and I don’t enjoy being on camera (would much rather be behind it), and I really don’t like my how my voice sounds when recorded. I feel like my voice is too high and soft, and oh how I wish I had a loud, rich sounding voice with resonance. I guess I will never be a radio DJ, lol. Even though I have many fears, concerns, and issues, I decided to make some video tutorials anyways. I really think there is a need for it, and maybe if I give you good information and tips, you will not care how I look, act and sound on camera. I will apologize for some of the bad audio in parts of this video, as my wireless lavaliere mic kept getting tangled in my hair which made a little static. My crazy hair has a mind of it’s own! One Smartphone, or Iphone, or Android phone with a video camera that can shoot HD video. Most phones can shoot 1920 x 1080 pixels HD, or 720 X 1280 pixels HD. Even phones a few years old can usually do this. Some newer phones can even shoot in high resolution 4K, not that you need that (a huge file size to store & most people don’t have screen that is 4k ready). My phone can shoot in 4k, and I never use it for this. 3 lights (this kit is great for video). I go over what types of lights I use, and how I set up the lights I use in the video. 1 Tripod and 1 Smartphone Tripod Attachment, as shown in video below. Video Editing Software or App (a free or paid one): IMovie (free) for MAC, Windows Movie Maker (free) for PC, or Filmora Wondershare Editor (inexpensive & easy to use for beginners & has MAC and PC versions). Stacey, this video and the one on lighting have been just what I was looking for in getting started with video. You make the steps seem so do-able for this newbie! I look forward to anything else you plan to put out. Also, check your Amazon links – one recommendation to a camera mount (Tackform phone holder) now leads to an item that’s no longer available. Maybe you have another suggestion? Thank you, Beth, I will find & replace with a link that is similar. These videos are very cool. I own a small specialty food business and plan on beginning to shoot videos using our spice blends to help promote our product. We are total beginners when it comes to video making but I have a son who is pretty good with editing so I just have to get the filming part down. I’m going to follow your lead and see where this takes me. Thank you, I’m excited for you! I should teach my teen son to edit my videos! Thanks for doing this! It’s so detailed and organized, I love it! I am getting on in years and plan to make a video cookbook for my kids of all my Xmas cookie recipes! Your welcome Christine! 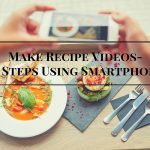 A video cookbook is such a great idea! Thank you for doing this series! I’m so excited for the next one! I follow your lc blog and love the recipes. I’ve started photographing and filming my own. Now I’ll be able to do it more professionally! Thank you! Thank you so much, Melissa. So excited for you. Thank you, I watched your video. Cooking is my passion, people tells me I have to do something about it. And I am ready but didn’t know where to start. Thanks again. Your welcome, Linda. You should, that is what people would tell me too, and I regret not doing it sooner because it can be overwhelming at first. Congrats! Thank you for your video. I’m just getting started and bootstrapping everything together. I appreciate you “putting yourself out there”- great basic content! Thank you and keep it up! Hi Eleanor, thank you for watching. So glad you found it helpful. Stacey, I have watched this video several times. Do you shoot all of your video with your phone? I can’t wait to see your next video.